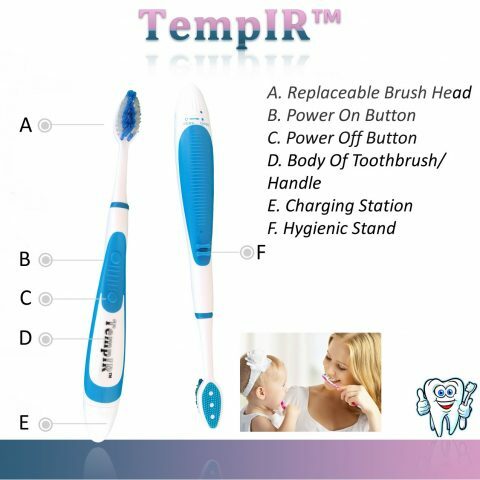 Category: Electric-Toothbrush Tags: best electric toothbrush, best toothbrush, clean teeth, deep cleaning teeth, electric toothbrush, kids electric toothbrush, oral b toothbrush, sonic toothbrush Brand: TempIR. DO YOU HATE GOING TO THE DENTIST? Sonic waves are used by dentists to break up tartar during a scale and polish. You can mimic this yourself and significantly reduce tartar build up by using this sonic technology every day. See description for why SONIC TOOTHBRUSH IS BETTER THAN OSCILLATING. GOOD FOR ADULTS AND KIDS – WHY? The vibrations emit a wave which extends beyond the brush’s actual contact with the tooth which covers areas beyond what the bristles can actually touch. This provides a more thorough brushing. This is extremely beneficial for kids who are not so thorough in cleaning because the waves reach awkward places near the gum lines and between the teeth. TRIPLE VALUE: 1. TWO toothbrushes per pack. 2. SAVE DENTIST FEES: TempIR proven sonic wave technology* gives you a CUSTOMISED brushing experience and ultra clean teeth. 3. SAVE MONEY: Batteries last for 100’s of uses. Four FREE spare brushheads and batteries included. YOU AND YOUR FAMILY DESERVE THE BEST IN ORAL CARE. Everyone knows the importance of good oral care and clean teeth but what is less widely known is that poor oral care can lead to a whole range of infections and diseases. We tend to forget that the mouth is the primary connection to the rest of our body! Apart from the cost of fillings, crowns and the more costly dental treatments, studies on poor oral care have shown links to heart disease, diabetes, COPD, low birth weight babies, cognitive dysfunction and even erectile dysfunction! So, while it doesn’t seem like much, that two to three minute brushing a few times a day could actually save your life. 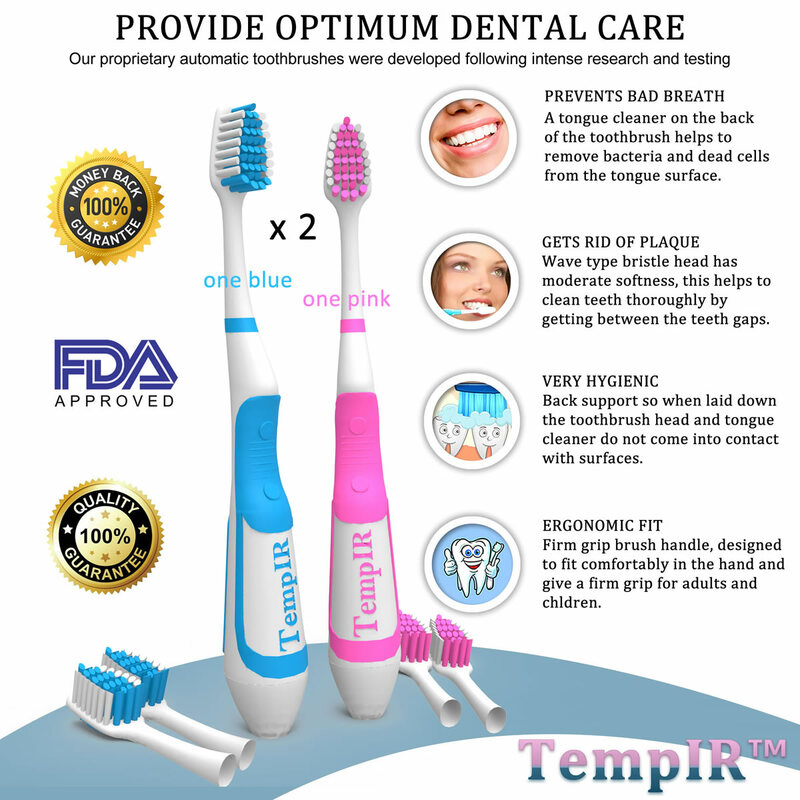 Cleans with 30,000 brush strokes per minute which gives tooth-by-tooth brushing, mimicking the brushing motion of a manual brush, but with the ENHANCED BENEFITS OF POWER. Manual brushing produces approximately 300 and normal electric toothbrushes produce only between 2500 and 7500. 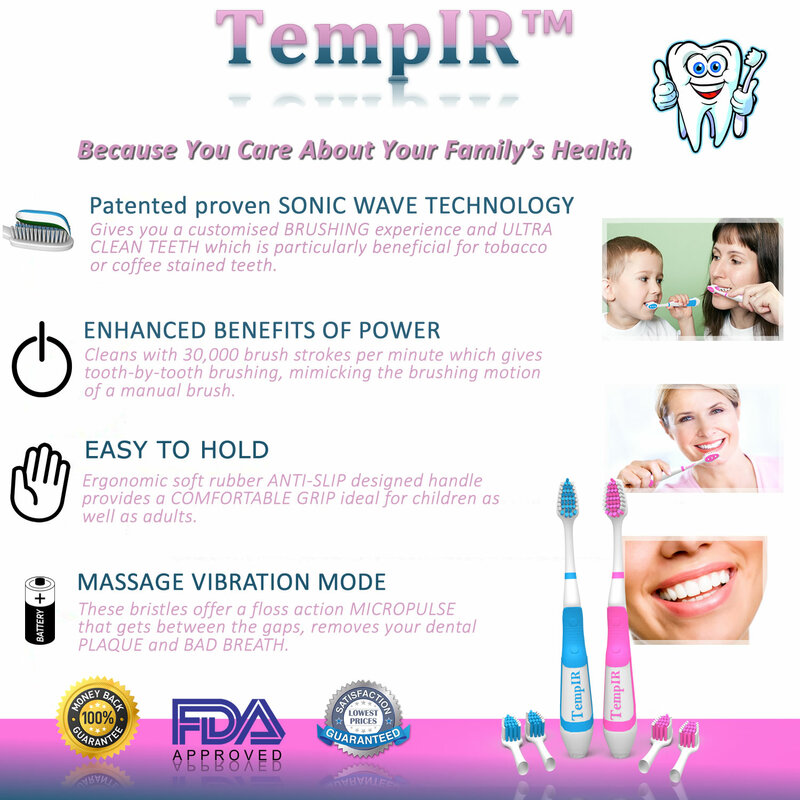 Uses Patented proven SONIC WAVE TECHNOLOGY* gives you a customised BRUSHING experience and ULTRA CLEAN TEETH which is particularly beneficial for tobacco or coffee stained teeth. Soft and comfortable thorough for deep cleaning teeth with the WAVE TYPE BRISTLES. 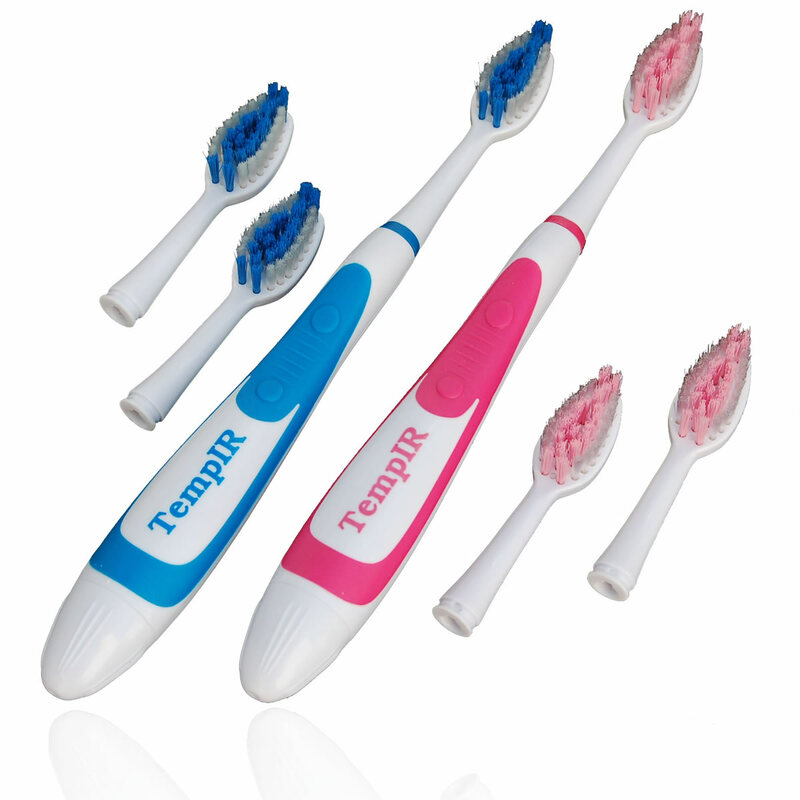 These bristles offer a floss action MICROPULSE that gets between the gaps, removes your dental PLAQUE and BAD BREATH. MASSAGE VIBRATION MODE for teeth, tongue and gums. CLEAN YOUR TONGUE and remove bacteria using the specially developed back of the brush head. 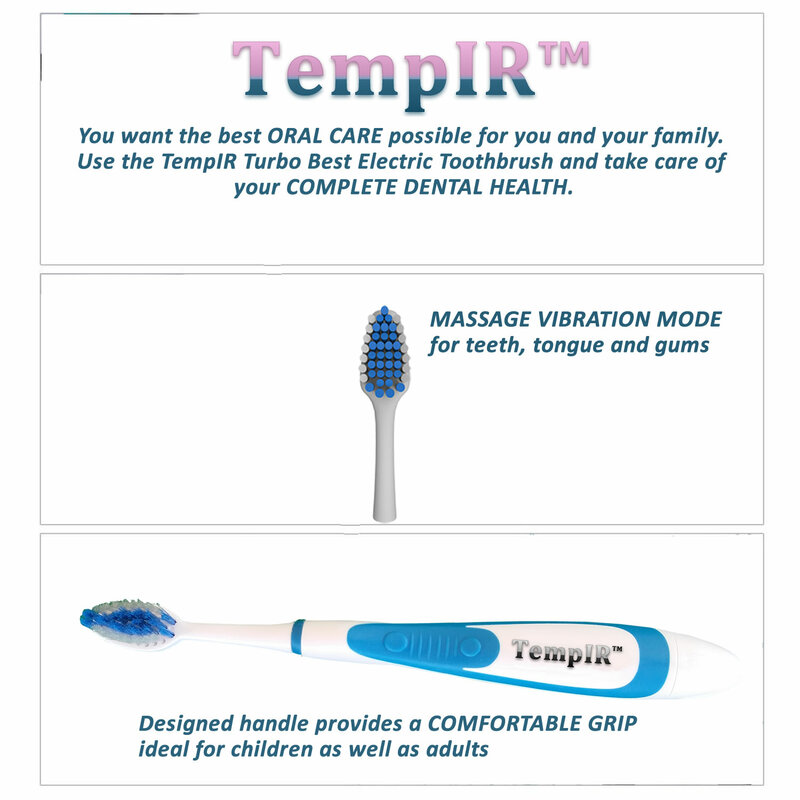 You want the best ORAL CARE possible for you and your family. 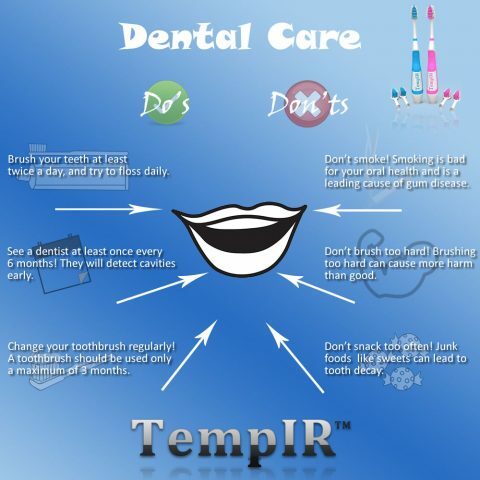 Use the TempIR Turbo Best Electric Toothbrush and take care of your COMPLETE DENTAL HEALTH. It is suitable for use by both adults and children. FIRM GRIP BRUSH HANDLE – Ergonomic soft rubber ANTI-SLIP designed handle provides a COMFORTABLE GRIP ideal for children as well as adults. Gently pulsates to break-up plaque. Manual brushing produces approx 300 brush strokes per minute – an electric toothbrush between 2500 and 7500 bspm – BUT THIS SONIC TOOTHBRUSH PRODUCES 30,000 bspm! 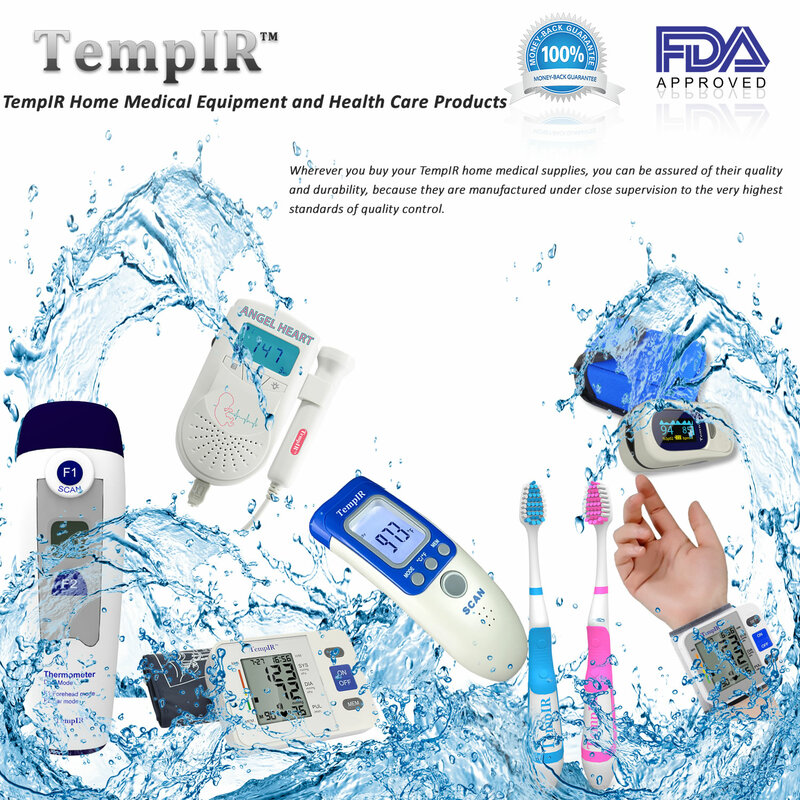 The TempIR Turbo Sonic Toothbrush is a high quality, sonic toothbrush one of the most recent designs in the 50 year history of electric toothbrushes. Will give the best results if used regularly, in the most comfortable way and as hygienically as possible. Best Toothbrush for HOME AND TRAVEL. Save space in your bathroom and travel luggage as no need for a cumbersome Charger. It also has a tongue cleaner on the back of the toothbrush which helps to remove bacteria and dead cells from the tongue surface. Moderate softness which is preferred by dentists because it causes less damage to the gums and teeth. Back support built in so that when laid down the toothbrush head and tongue cleaner do not come into contact with any surfaces. Because there is no charging unit required the toothbrush is ideal for travelling but is also perfect for home use. The pack contains two brushes with four additional spare heads. 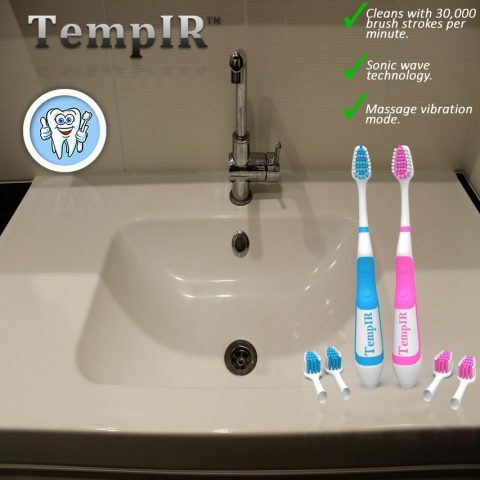 This TempIR Portable Battery Sonic Toothbrush has been developed to leave your mouth and teeth feeling and smelling clean and fresh and in the healthiest way possible by controlling and eliminating plaque build up and bacteria. Read our best electric toothbrush reviews. SAVE MONEY as batteries last for 100’s of uses. Four FREE spare brushheads and batteries included. 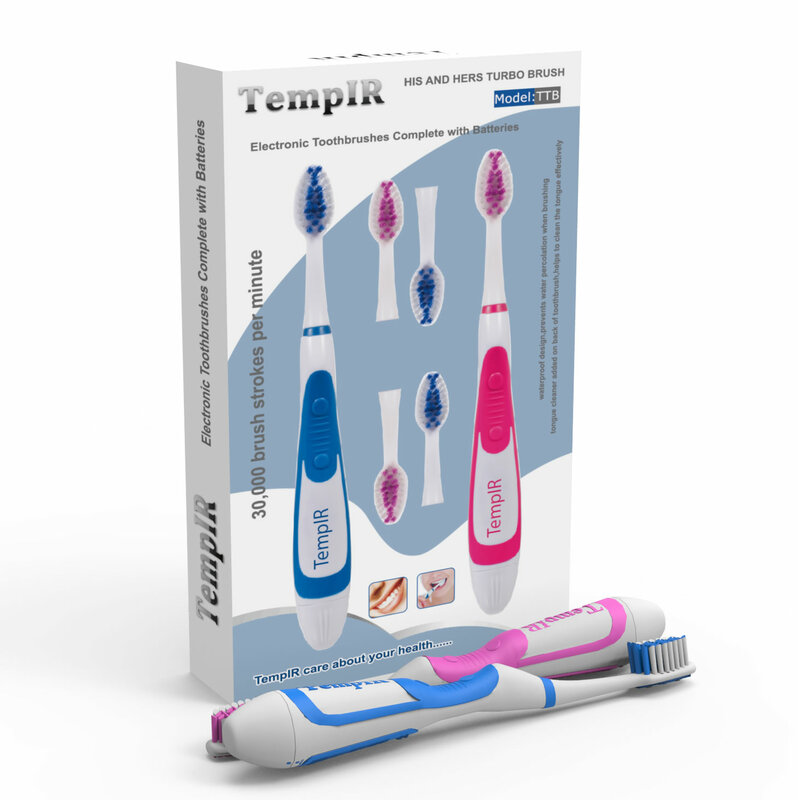 Ultra High Powered Rechargeable Electric Sonic Toothbrush engineered to perform. You also benefit from a Lifetime No Hassle FREE PRODUCT REPLACEMENT OR REFUND Guarantee. Click the “Add to Cart” button now and you will soon be enjoying superbly clean teeth, fresh breath and better health. The focus being on ease of operation. I ordered this item and received very quick delivery. This is a basic electric toothbrush, which is just what I wanted. If you want more bells and whistles, look at other more expensive models. This model, however, seems to do it all. I like the simplicity of this brush. The brush is very easy to use, though it may take a few days to get get used to it. Remember, this brush does the work for you. For the first few days, your gums may be a little tender and you may notice some slight bleeding, but this is normal. In no time, you’ll actually enjoy the sensation of the brush. And the feeling when you’re done? Like you just walked out of the dentist’s office! Very impressed with the ergonomic designed handle and the gentle cleaning this toothbrush provides. I find that this handle is easy to grip unlike my bulky electrical toothbrush. The handle is made out of soft rubber that does not slip in my hand when it is wet. The back of the brush head is a tongue cleaner which is important to use for proper oral care. The toothbrush is even designed so it sits and doesn’t flop over when I set it down. I am totally pleased as to how well this toothbrush cleans my teeth, massages my gums and how well it cleans in between my teeth. Pleased too, that unlike my electric toothbrush that requires a charging station that had to be plugged into one of my electrical outlets, this is battery operated (battery already installed and your toothbrush is ready to use when you receive it). Awesome to get 2 battery operated toothbrushes with four replacement brush heads. I recommend this for everyday use at home and as a toothbrush to take with you. This comes with a full lifetime no hassle 100% guarantee. I am obsessed with brushing my teeth and getting that wonderful minty clean feeling so I was super excited to give this product a try! I love that there’s a pink and blue…coincidence that pink is my favorite color and the blue is for my boyfriend. After brushing with this toothbrush, my entire mouth feels clean and fresh. Sometimes with regular toothbrushes, my teeth and mouth feel dirty again after about an hour…but this toothbrush keeps my teeth, gums, tongue, and entire mouth feeling fresh and clean for hours! I love the tongue cleaner, although it does tickle! The vibration of the toothbrush just feels like I’m getting a better cleaning and I have actually noticed less plaque build up on the back side of my bottom teeth since I began brushing with this product! I would definitely buy this product again and recommend it to all my friends and family! Love the way these feel when you’re using them! My husband was a little surprised that they don’t rotate or doing anything fancy besides vibrate, but they don’t lack from not! We’ve noticed that our mouths really do feel cleaner switching from a normal toothbrush to this one, and we were happily surprised to not that they did come with 2 replacement heads each as shown- and the batteries came preinstalled! It was easy to open the packaging, and it is great to have our toothbrushes color coded, although the pink one isn’t quite as vivid as it is in the top picture (it is more of a muted light red)- but that doesn’t hurt my feelings at all, was hoping for it to be like the secondary pictures more. Overall, we were very lucky to receive these to review, and we’re both very happy with the way they have been working. Love this toothbrush!!! I have tried several brands of “manual” and electric toothbrushes and this one is really great!!! The packaging doesn’t “pop” visually but the way your mouth feels sure will!! The bristles are really dense and covers really well, giving a great all around clean. I was skeptical at first but this brush is great plus you have the added bonus of additional heads to go with both brushes!!! Can’t beat that deal!! I use a sonicare at home, but have been looking for a good electric toothbrush to take on travels. So far I like it a lot, even more of a perk there is a pink one for me, blue for my honey, plus lots of extra brush heads. My teeth feel and mouth feel clean after i use it, more so than a normal toothbrush, and I can take it on trips without needed to bring a charging dock, etc. Stoked I don’t have to use my crappy travel toothbrush now! I received this product during a promotion. I reviewed these in the past but my review seems to have disappeared so I am adding another one to make sure people know what a great set it is! I was in the market for new toothbrushes as I was kind of tired of the same old same old. I was offered an opportunity of a discount in exchange for an honest review for these and thought it was great timing. First off, I love that the kit has two brushes and two refills for each brush. If you replace your brush heads at the recommended 6 month rate, this is 18 months worth of use in one package for a couple or two kids- or you could mark some of the heads and use the same brushes for several people! If you are on your own you’ve got a cool 3 years of brushing here! Next on to the grip of the brush- the handle is lightweight but substantial enough that you won’t feel like you are going to break it. The barrel is slightly bigger and rounded and fits really well into your palm. The on/off is easy to find and use without having to look at it. I’ve been the owner of electric toothbrushes for years now, all re-chargable and expensive. I took one on holiday this year and it wouldn’t re-charge so used my emergency back up manual. Saw these on Amazon for a really good price, this will be perfect even if it’s just for holidays thought I, how wrong I was. I had to do a dummy run for when I go on holiday again soon and they are brilliant, this will now be my permanent toothbrush. The vibration is sufficient to feel your teeth are being cleaned minus the buzz all around your head, light (a plus for travelling) it’s quiet, comfortable to hold and my teeth really do appear to be cleaner. I thought I was onto a winner with 2 brushes and 4 replacement heads as my husband can’t use electric toothbrushes, they make him feel sick however I seem to have lost one….to him! He’s fine with it. Batteries included, another plus. I would highly recommend this product and seller. I love this toothbrush! It is very powerful and leaves my teeth feeling so fresh and clean. The design of the toothbrush is excellent. Very comfortable to hold, and even has a tongue cleaner. I am very happy with this purchase. We are very pleased with the product – and like the idea of his’n’hers in one pack in different colours.Arrived very quickly, and having tried it for a few days we’re pleased with the cleaning effect – it does feel like it makes a difference.The chunky handle is easy to grip for my husband who has some mobility problems but nice for anyone.I liked the idea of it being battery operated as we already have too many chargers, and it’s easier to pack to take away.Not sure how long the battery will last but so far has been fine – and anyway they are standard size.Also, comes with spare heads which is another plus.Great value for the price. Just the job for our forthcoming holiday, travelling lite, no room to pack charging stations. Comes with batteries, each brush takes one AAA battery easy to replace via a twist-off cap. Great colour combo so the wife has her own set and will last for ages with the 2 per brush spare heads. Like the dual action bristles for teeth and the tounge cleaner on the reverse side. I realy like the support feature to keep the head raised when placed down on the sink and it also provides extra grip whilst brushing. Positive on/off buttons. 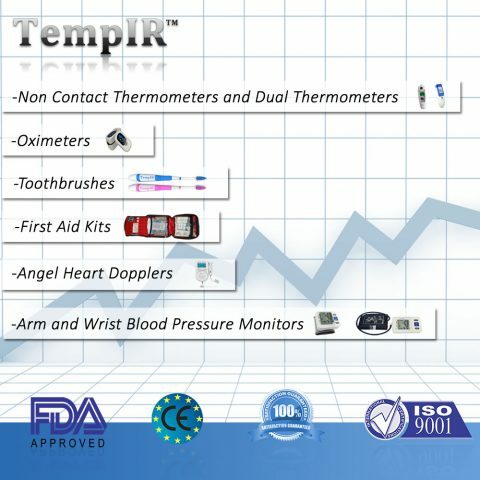 The TempIR His and Hers Turbo brush is already packed! Lots of people have left excellent reviews for this product, but these toothbrushes really are as good as everyone says. The batteries last for much longer than any previous battery driven toothbrushes we have used and they are so compact, whilst not losing any effectiveness as a toothbrush.As soon as ours arrived I ordered some more then we have plenty of spares. A cracking product. Just received these about 4 days ago and so far I am very impressed. Firstly they were delivered within a few days of ordering, also packaged well. The bristles are nice and soft, it is super light and pretty fast. What an excellent price for 2 brushes and 4 heads! The only thing I wish it had was a slow and fast speed, however, I will get used to the one speed. In the past I have always purchased an expensive and well known brand of brush but decided to try a cheaper one…..so far…..I’m happy! Amazing value (purchased for $19.99). So far no issues. I actually use this on my dog while it’s off atm so that she may get used to it. I’ll progress to having it on for longer periods of time when I think she’s ready. FYI, she’s a cocker spaniel/poodle ~20lbs and this brush is the perfect size.